Lightweight, hard anodized aluminum. 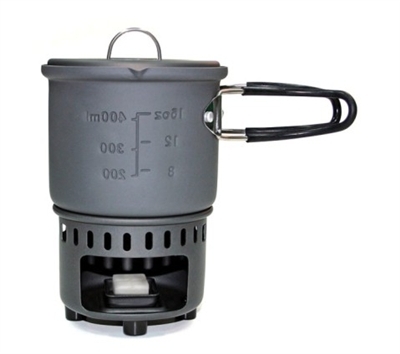 Includes pot (585 ml), lid, and windshield stove unit. Stove unit fits inside pot for space-saving convenience. Foldable, no heat handle. Uses Esbit 14g fuel cubes or can build small natural fire using sticks and twigs. Mesh bag also included for storage.